Very silly, very fun. Illya autopsies a wolf. There are secret passages and caves. There is banter. There's also a very weird friend-of-author insert -- so transparent that I recognized it for what it was without knowing the person in question. (Some '60s SFF/horror magazine guy -- not my area of expertise.) But whatever. Snarky wolf autopsy. I got what I came for. This is actually a well-written, short and tight thriller, set in the 1960s "Man from U.N.C.L.E." series, with a touch of fantasy at the end. Napoleon and Ilya are dispatched to Romania to investigate the murder of an U.N.C.L.E. agent. They find themselves caught up in an apparent vampire scenario involving a descendant of the Drakula family, Forrest Ackerman, wolves, the lost treasure of the Huns, and other fun touches. The writing is professional, smooth, and witty--great fun! My favorite thing about UNCLE, be it the novels or the TV episodes, is that they never quite end up where you expect them to. In this case, I was consistently and pleasantly surprised with the supernatural becoming the digitally unnatural and back to the supernatural again. THRUSH's motive seemed a bit weak, but the romping through mysterious mountain castles and chasing superstitions and werewolves through the countryside quite made up for it. The best part is almost certainly Illya and Napoleon's unwillingness to admit their belief in the supernatural and their backhanded attempts to reassure each other and themselves that everything is Logical, Rational, and Fine. (Illya carving crosses into his bullets was a nice touch.) McDaniel's works have consistently been my favorite of the UNCLE tie-in writers, and this one doesn't really disappoint at all, especially with the playful 'was it really' ending that had me actually laughing. A bit more sterile than the well-written Man From Uncle fanfiction that's out there, but this was an enjoyable read nevertheless, very much like an extended episode. It's like fanfiction but it's a book. As good as anything I've read on the internet. Classic Solo and Illya adventure. Great characters and plot building. Gosh, this was fun, in a gruesome kind of way! It's a clever plot with some nice details, cleanly written and with some great dialogue. I can see why this author is the favorite of fans of the show; he gets the repartee exactly right. Here are a couple of examples:(in the mountains of Romania, our heroes are being chased by a pack of - apparent - werewolves)..Napoleon stopped and leaned against a tree. "I think we've lost them...The cold," he said sagely. "Wolves don't hunt when the temperature gets below freezing. "Ilya looked at him in amazement. " You're thinking of rattlesnakes. Wolves just get more active when it's cold. I remember when I was a little boy in Siberia, being chased by a pack of wolves all the way from Yakutsk to Kirensk..." (pg 117)And then there's this rather long exchange. The characters are a local nobleman, a young UNCLE agent, also local, and Napoleon:"I'm coming, too," said Hilda. If this is what I think it is, you'll need everybody who can handle a gun. "Zoltan frowned. "I do not think you should. This is not a proper business for a young lady to be involved with. ""But I am involved! Who is more involved than I am? I found Carl's body; I was almost killed by that vampire...No one has more right than I to be in on the final attack. What about you?" she finished aggressively.Zoltan drew himself up. "They are using my castle and my name," he said. "Your life may have been in danger, but my family honor means more to me than my life. "Napoleon looked at Illya. "I feel kind of left out," he said. I'm just doing it because it's a job. Maybe we should stay here and let them go." (pg 128).I laughed aloud at that. Having been written in the '60s, there are some things I didn't like - namely, abuse and killing of wolves, and a gruesome dissection scene. Don't kill wolves, boys! You're supposed to be the good guys! Of course, it's the bad guys who are abusing the poor animals, and our guys just shoot in self-defense. Environmental faux pas aside, this is a solid, fast-moving story that captures the characters well and has some very entertaining scenes. If you're a fan of the show, you'll enjoy it. This is a MAN FROM U.N.C.L.E. book? Just barely. One of the challenges of novelizations is how to make a story from one medium, in this case TV, feel familiar in a new medium, a novel. McDaniel did this quite well in his previous U.N.C.L.E. book, but built in failure here by using the structure of a vampire story and making the little of the U.N.C.L.E. mythos he uses serve that story. He could change the names of Napoleon Solo and Illya Kuryakin and call their agency something else and readers would not notice this should be an U.N.C.L.E. book until the final 30 pages when it finally, finally feels a little like U.N.C.L.E. for a time. The story also suffers from the decidedly camp elements that eventually put off the viewership of the television series. Ugh.The book gets one star for existing and another because of McDaniel's very readable prose, but this is a bad book. For junkie fans only. Another of the best of the book series based on the TV series. (LOL) This is probably the one I remember most clearly (probably the "vampire" tie in, I was 14 or 15). At the time I snatched up most anything that had to do with The Man From U.N.C.L.E. Into the Transylvanian Alps we go to investigate the death of an U.N.C.L.E. agent. The story is good (well written) and the vampire plot twist doesn't come across as hokey. The characters are more true to "themselves" here than in some of the other books. 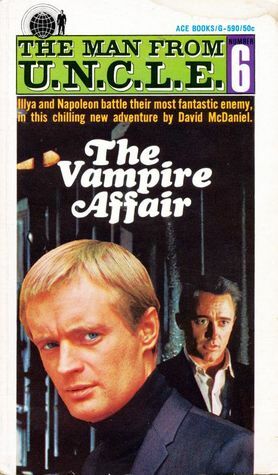 Napoleon and Illya more like "themselves" (and if you don't think I was a "fanatical fan" I'm talking about fictional characters seeming more like their "real selves"). Again I freely admit to rabid nostalgia, a certain amount of prejudice and to having a fan's liking for anything "Man From Uncle"... However, this is a fun read. Enjoy. This book in the popular series is a fun and manic romp through Transylvania, drawing upon the author's considerable knowledge about vampire lore, both the kind that came out of the old country and that which comes from Hollywood. One of McDaniel's impish pranks on the reader is the the inclusion of real-life monster maven Forest J. Akerman, creator of the luscious Vamperilla and then-editor of "Famous Monsters of Filmland." Much of the comedy derives from the byplay between the fannish Akerman and the UNCLE agents. A fun book for spy fans and classic vampire films enthusiasts. an old favorite in a different edition. Our favorite agents are sent to Romania to investigate the death of an U.N.C.L.E. agent found lying against a tree, apparently dead of suicide. But all blood had been drained from the body, twin punture marks on the neck and no footprints around the body but those left by the dead man. Waverly believes it all a hoax.But is it? Or could it be an insidious new plot of Thrush using the old legends to mask what they were doing.